New York Vehicle and Traffic Law section 1192.4 makes it a misdemeanor for a motorist to operate a motor vehicle while the motorist’s ability is impaired by the use of a drug. The drug we most often see as the basis for the motorist’s impairment is marijuana. While police frequently arrest motorists that they believe are driving while under the influence of marihuana, these arrests are often difficult to prosecute. Seasoned criminal defense attorneys successfully prevail in getting these charges either dismissed or reduced on a regular basis. The reason for this is the difficulty that prosecutors have in proving that a motorist was under the influence of marijuana at the time that they were pulled over. The only scientific evidence which can be used to prove marijuana impairment is through blood or urine samples. THC detected in blood or urine is not a reliable indicator of present use or impairment. Furthermore, collecting either of these samples requires either the consent of the motorist or a warrant issued by a judge. As a result, prosecutors are left with the police officer’s observations as to the motorist’s demeanor and/or any statements made by the motorist at the time of the car stop or during the arrest processing. Studies have clearly shown that the signs of marijuana impairment can also be attributed to various other conditions such as fatigue and allergic reactions. So while an officer may believe that a motorist is “stoned”, he or she may actually be sleepy or suffering from seasonal allergies. Which leaves us with the most dreaded indicator of them all: the defendant’s own statements. Motorists notoriously get very talkative when they are pulled over. They believe that they can talk their way out of the inevitable ticket. This “chatty” nature is what gets most motorists in trouble. Since marijuana has become more and more accepted in today’s society, a “stoned” driver, thinking that the officer will share this view, regularly confesses to his/her marijuana ingestion. Most successful marijuana DUI/DWI prosecutions stem from these “road side” confessions. If you are driving stoned in New York (Manhattan, Bronx, Brooklyn, Queens, Staten Island, Nassau and Suffolk Counties, Long Island, Westchester) and you get pulled over, remember to keep your mouth shut. 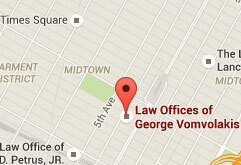 If you are arrested remember to call the Law Offices of George Vomvolakis. Their experienced DUI/DWI lawyers will get you the result you need. Can I get a DWI for Driving With Marijuana in my System in New York? What is the Difference Between a DWI and a DUI in New York?